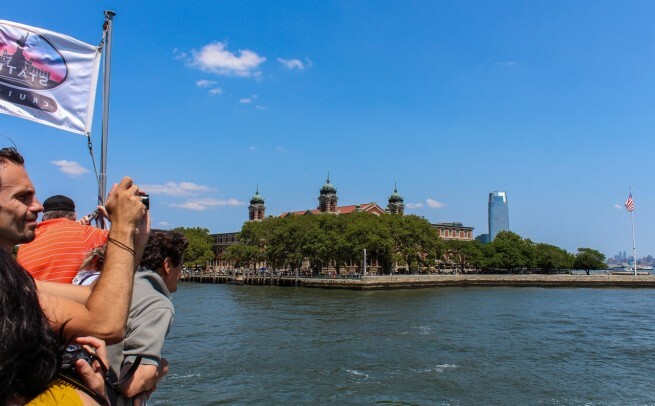 We offer a really cool Ellis Island and the Statue of Liberty tour, that includes Ellis Island ferry tickets, so whether you go with our expert guides or take it in solo, here’s the Walks of New York guide to Ellis Island: How to get there, its history, and what to see. 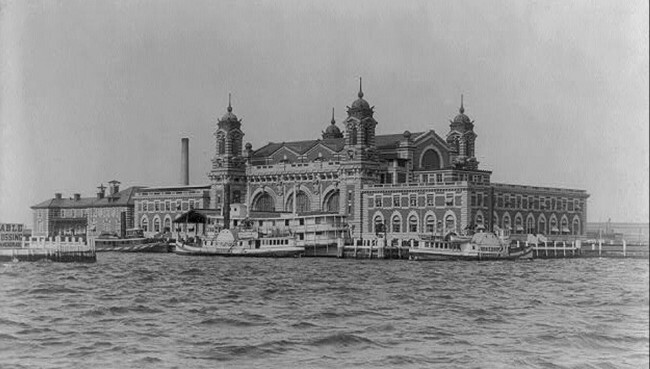 Located just south of Manhattan in New York Harbor, Ellis Island served as a United States Immigration Station from 1892 to 1954. All immigrants arriving by steam ship to New York (the nation’s primary entry point) were brought to the island for inspection and processing before being allowed to enter the country. More than 12 million people passed through Ellis Island in total! This vital piece of American history (and, for millions of Americans, personal history) is now a National Park, beautifully restored and maintained by the National Park Service. 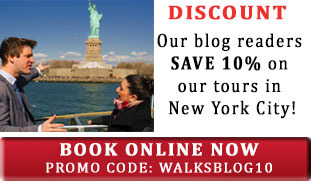 One terrific option for exploring Ellis Island is to join our Statue of Liberty and Ellis Island Tour. The half-day tour includes ferry tickets and access to both monuments (including Lady Liberty’s frequently sold-out pedestal & museum) and an expert guide who will share the fascinating stories behind these national treasures…including a few secrets. 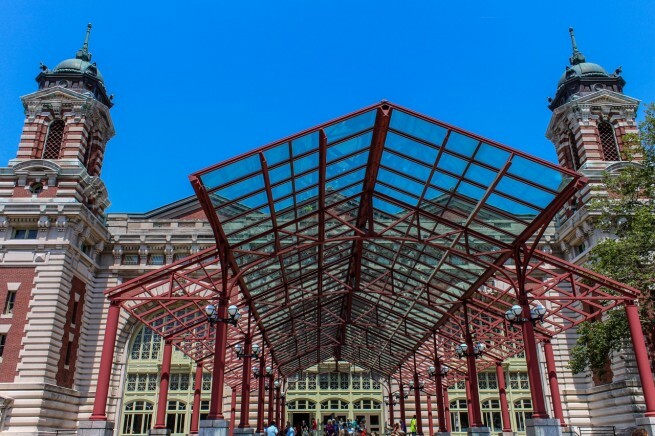 If you prefer to visit independently, Ellis Island is reached by ferry service. Tickets are required and can be purchased at Castle Clinton, the historic circular fort in Battery Park. To reach Battery Park, take the subway line 1 to South Ferry, 4 or 5 to Bowling Green, or the R or W to Whitehall Street). Ferries depart from Liberty State Park in Jersey City, New Jersey, as well. Ellis Island Ferries leave every 20 – 30 minutes, from 9:30am to 3:30pm (subject to change and with expanded hours in summer). The ferry stops at Liberty Island before continuing to Ellis Island. Ferries then return to Manhattan (with the final Ellis Island ferry departing at 5:15pm). Ferry schedules are posted at both destinations. Check the ferry website, or call the Park Information Line at (212) 363-3200, for more details. Be advised there is security screening prior to boarding, and large bags or luggage, pets, and anything deemed a weapon are not permitted on the ferry. 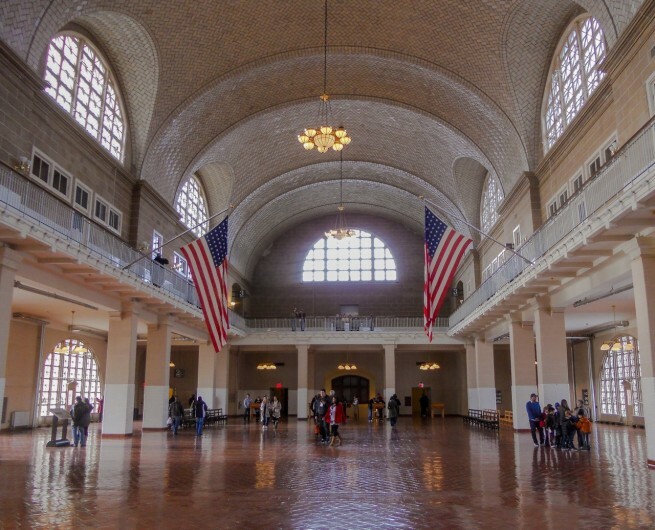 Following in the footsteps of the immigrants, you’ll depart the Ellis Island ferry and enter the main building, where you’ll find a display of luggage and cases brought by new arrivals. To the left is the main information desk, offering brochures and maps (available in several languages), helpful Park Rangers and screening times for the 45-minute documentary film “Isle of Hope, Isle of Tears” (worth seeing). To the right is a desk where Audio Tours (available in 9 languages!) can be rented for $8. This level includes a permanent exhibition called “Journeys: The Peopling of America 1550-1890,” the theater showing the documentary, and the interactive “Flag of Faces,” a large video installation filled with images submitted by individuals of their families, their ancestors, or even themselves. (The exhibit accepts photo submissions, and can also be viewed online). To the right is a good cafeteria, as well as a gift shop and restrooms. Want to look up your family history? Behind the info desk is the Family Immigration History Center, which provides visitors with computer and multimedia technology, as well as professional assistance for investigating immigration history, family documentation, and genealogical exploration. (Watch a video about the Center, or click here to search records online). Continue in the immigrants’ footsteps up the stairs (elevators are available at either end of the building) to the “Registry Room,” where millions of hopefuls waited to be interviewed by inspectors at the standing desks at the far end. 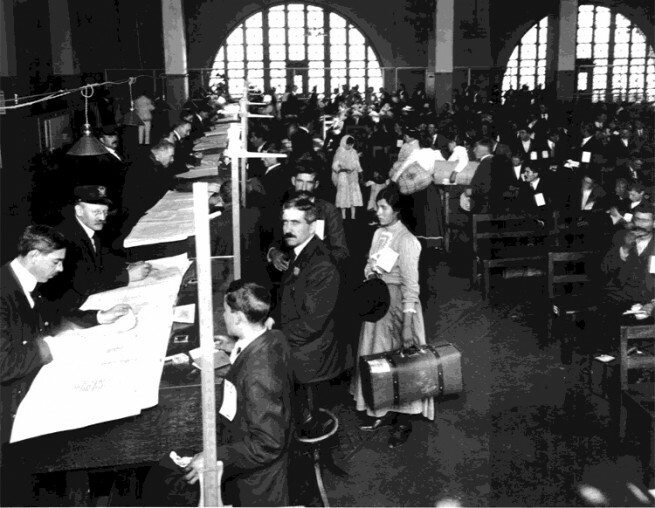 Immigrants were interviewed in the Registry Room. At the southwest corner of this level is an intriguing exhibit, “Through America’s Gate,” which chronicles the immigrants’ experience at Ellis Island—including physical and mental examinations. Look for the (scary!) long, metal buttonhooks used to inspect eyelids for trachoma. 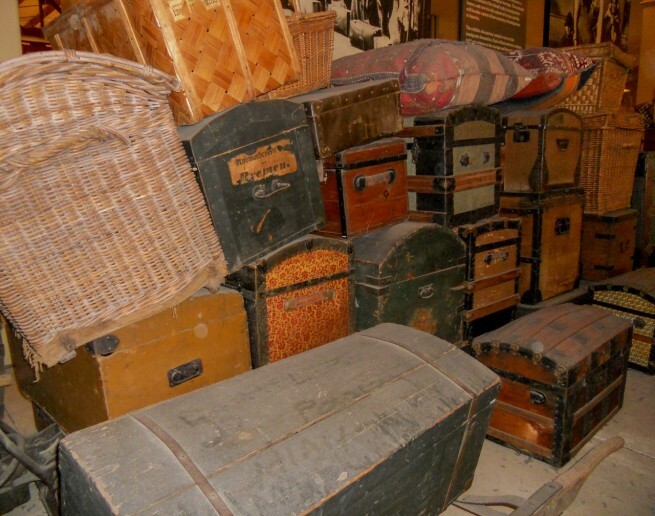 On the third floor are several fascinating and moving exhibits, including “Peak Immigration Years,” exploring the journey to America and the challenges faced upon arrival, and “Treasures from Home,” displaying prized possessions brought from homelands. There is also an exhibit about the restoration of Ellis Island (allowed to badly decay for decades) and temporary exhibits. NOTE: Ellis Island suffered severe damage during Hurricane Sandy. Many of the exhibits on the 2nd and 3rd floors have been closed or their items removed until necessary repairs are made. At the time of writing, no date has been given for their return. Along the balcony overlooking the Great Hall, you can peek into a cramped dormitory room, showing accommodations for immigrants compelled to remain overnight. 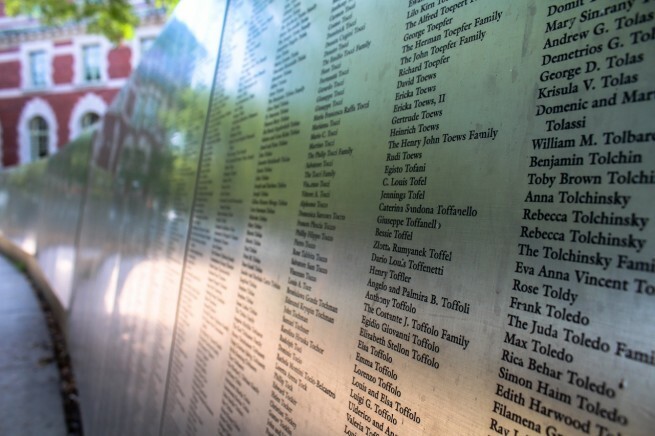 Outside the building is the “American Immigrant Wall of Honor,” which contains more than 700,000 names inscribed for posterity by family members and friends. Go here to search names or have one added to the wall. Behind the wall is a stunning view across the harbor of the Manhattan skyline. Allow several hours on the island to fully appreciate the enthralling and moving experience of exploring this historic treasure. Want to know more about Ellis Island? Here’s a video with some terrific images (and a schmaltzy “Titanic” soundtrack)! Have you ever visited Ellis Island? Did your ancestors come through there? Tell us in the comments! A great article Jeff. I never thought of visiting Ellis island but it is really a historical landmark woth visiting.